"Our goals are to foster the exchange of ideas, contribute to the preeminence of UCLA as one of the world’s great research universities and allow UCLA to compete with other top-tier institutions for major academic conferences." In a UCLA Magazine article exploring the need for expanded conference and lodging facilities on campus, faculty and administrators were overwhelmingly supportive of the current plan, citing frustration with having to hold events off-campus, book meeting and conference rooms at the Ackerman Union too far in advance, and miss the opportunity to show off the UCLA campus itself to visitors who wind up staying at the airport or in town. Originally the new facility was conceived of as an expansion of the Faculty Center, which would have been torn down and rebuilt, but many faculty voiced an attachment to the historic building and said they would prefer to keep it and expand elsewhere. The UCLA School of Public Affairs received a huge donation from the Luskin family last year, which included a conference center component (see our blog on the topic). 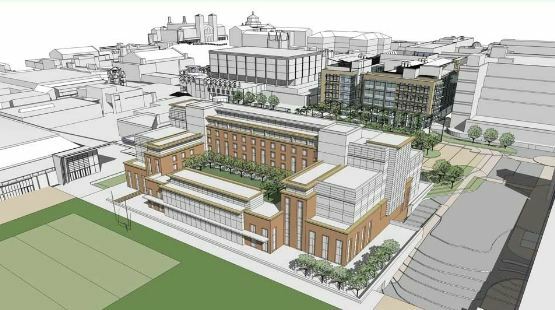 It seems the latest plan is a happy compromise of the two building needs. What will this mean for our BCI Biotechnology Vendor Showcase exposition currently held on the UCLA campus at the Ackerman Union? We can't say for sure yet, but our initial thought is that it can only be a good thing to have more rooms available, more facilities to choose from, and better infrastructure for events of any sort. Furthermore, we agree with the engineering professor who said (in the Magazine article) that the modern conference and guest center is "essential to promoting UCLA as a global brand...[and] is especially critical to promoting interactions across the Pacific." And insofar as the new center creates even more of a faculty hub in the center of campus, that can only make our events more popular and convenient. Biotechnology Calendar, Inc. is a full service event marketing and planning company producing on-campus, life science research tradeshows nationwide for the past 20 years. We plan and promote each event to bring the best products and services to the best research campuses across the country. Visit our website for information about upcoming shows in your area and to register to exhibit or attend. Or call to talk to one of our friendly, knowledgeable sales associates.